Written for the practicing analyst, Analytical Methods for Geochemical Exploration offers thoroughly tested chemical analysis methods for determining what base or precious metals are in geochemical exploration samples, such as rocks, soil, or sediment. Theory is kept to a minimum and complete procedures are provided so that no additional sources are needed to conduct analyses. Geochemists, geologists, soil scientists, and mining engineers. Introduction. Principles of Determinative Methods. Basic Materials. Methods of Sample Preparation. Field Methods. 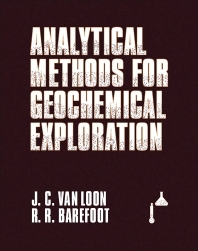 Geochemical Methods for Soils and Related Samples. Lithogeochemical Analysis. Determination of the Platinum Group Metals and Gold. Biogeochemical Analysis. ICP Source Mass Spectrometry. Each chapter includes references. Index.